"Will the familiar warning for airline passengers to "discontinue the use of all portable electronic devices" become a relic of the past? Every so often the FAA reviews its policies limiting mobile device usage on airplanes. 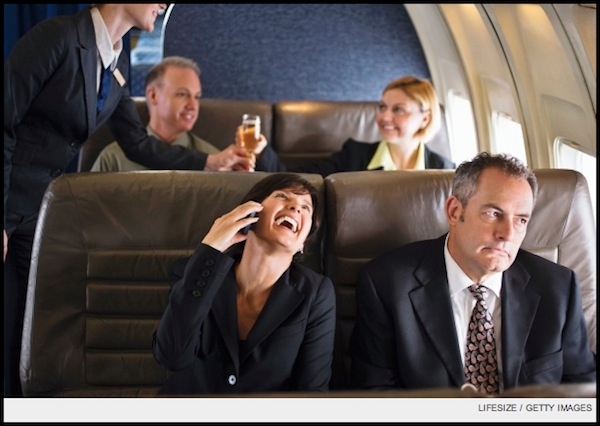 They're at it again, but it must be mentioned that this particular study does not include the use of mobile phones while in flight - that's the FCC's domain. The FAA claims (in a study performed "last year") that they have 75 documented cases of consumer (passenger) electronic devices interfering with on-board systems, and the new study group aims to either confirm or debunk the current conventional wisdom that mobile devices can interfere with instruments, specifically during takeoff and landing. Skeptics point to the fact that tablets and laptops may be used by the crew, during these critical times, but not used by passengers. The study goal is to determine the what, where, when and why for the existing rules and regulations. While I do think that the rules are a bit one-sided in favor of the airlines, I'm not really that inconvenienced by having to turn off my laptop/phone/tablet during takeoff and landing. Safety trumps convenience in my opinion. How about you? Real safety has to come first. If our devices are considered safe to use, let's do it except for one thing - phone calls. There is no way this will work smoothly. I predict lots of annoyingly loud passengers yelling into their phones and an increase in altercations. Love to see that report. Have searched over the years of any documented, verified, incident of interference being directly attributed to consumer electronics. Wouldn't put it past a 20W Ham rig being a problem, but the typical device, meh. Cripes, half the flights have WiFi now anyway. That said, I don't have any problem with the crew wanting your attention and focus during takeoff and landing. I can't hear announcements with my Zune and Bose noise cancelling headphones on during a flight. I expect during takeoff and landing, I might want to. There is a reason most states ban headphones when you are driving, safety. What's wrong with saying the takeoff/landing requirement is plain old safety, not some marginally defensible interference fairytail. Oh, and yea, I certainly don't need every other person shouting into their cell phone on my flight, VoIP or otherwise. Amazing that things folks would normally whisper to each other to help keep them private, they will shout into a cell phone in a crowd. So leave the takeoff/landing ban on use, but be up front about why. As an airline captain for 23 years I can personally attest to having had issues in flight from PED's (iPad data radios for sure). I have been one of those that filled out the FAA report. For me it has been interference with communication radios where we had difficulty hearing air traffic control because of frequent, rhythmic sounds (not unlike what you hear when you place your cell too close to a speaker or wired phone cord) that rendered both of the VHF com radios unusable at regular intervals during the entire flight. Most people with 3G iPads don't even know it has a flight mode. It also seems that i have had an increase in navigational radio issues that are hard to link to PED use. I am a huge technology lover and user and i would be the first in line to be skeptical but an airplane is not the place to be stubborn and take a chance that you might be contributing to radio/navigational/mechanical irregularities. Also, it's not just an issue if one PED is left on but several where a critical mass of interference can be reached. Oh, as for domestic WiFi and international airline carrier use of cell phones, placing the base units in close proximity to your device makes it throttle to minimum transmiter power and is less likely to interfere. If you ever do accidentally leave your phone on in flight you will land with the phone dead or with 50% less battery than you were expecting. Last edited by Jetjockgordo; 11-18-2012 at 02:05 PM..